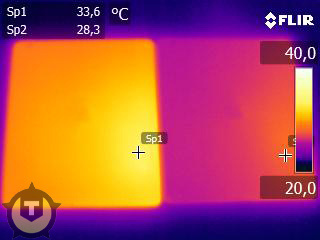 Thermal imaging of a side-by-side comparison of the third-generation iPad and the iPad 2 found Apple's latest tablet running 10 degrees (Fahrenheit) hotter than its predecessor. Dutch site Tweakers.net (Translation, via Engadget) performed the GLBenchmark test on the two generations of iPads for five minutes to measure a heat difference. Using an infrared camera, the publication discovered that the hottest part of the new iPad was 33.6 degrees Celsius (92.5 Fahrenheit), while the iPad 2 measured 28.3 degrees Celsius (83 Fahrenheit). Though the new iPad does appear to run warmer than the iPad 2, it should be noted that the temperatures are still well within Apple's specified operating temperature of 32 to 95 degrees Fahrenheit (0 to 35 Celsius). The report went on to speculate that the new GPU is the likely cause for the added heat in the third-generation iPad. The new iPad features an A5X chip with quad-core graphics, presumably from the PowerVR SGX543MP4. A teardown of the tablet late last week revealed a new metal heat spreader affixed on top of the A5X. Anecdotal evidence from iPad users on the Apple Support Communities forum shows that some users have found the new iPad to be warmer than the previous generation. One discussion had generated nearly 19,000 views and 219 replies as of Monday evening. Apple said on Monday that it has been "thrilled" with the first weekend of sales for the new iPad. The company announced later that day that a record three million units had been sold over the weekend. Thousands of customers lined up to purchase the iPad when it went on sale last Friday. In addition to its improved graphics capability, the device has a Retina Display, larger battery and improved camera.